The Boonshoft School of Medicine Office of Research Affairs presents a Central Research Forum each fall to showcase biomedical, clinical, medical education and public health research conducted at Wright State University. All WSU investigators, graduate students and medical students are invited to present posters on their work. The 2018 program will be held Thursday, October 18 at 4:00 p.m. in the Wright State University Student Union -- Apollo and Endeavour rooms. The Central Research Forum will include a poster session showcasing the range of Wright State’s biomedical, clinical, medical education and public health research. This session is an opportunity to share your research with colleagues and potential collaborators in a stimulating, convivial setting with a reception. The R.S.V.P. and Poster registration survey is now closed. An abstract must be submitted for your poster to be considered for inclusion in the Boonshoft School of Medicine Central Research Forum. If you have any questions, please leave a message at (937) 775-2161 and reference the Boonshoft School of Medicine Central Research Forum. Or, email jeannette.manger@wright.edu with subject: "Central Research Forum question." The Boonshoft School of Medicine Office of Research Affairs presents a Central Research Forum each fall to showcase biomedical, clinical, medical education and public health research conducted at Wright State University. The 2017 program will be held October 5 at 4:00 p.m.
Dr. Margaret Dunn, M.D., M.B.A.
Dr. Jeffrey Travers, M.D., Ph.D.
Dr. Timothy J. Broderick, M.D. The Central Research Forum will include a poster session showcasing the range of Wright State’s biomedical, clinical, medical education and public health research. This session is an opportunity to share your research with colleagues and potential collaborators in a stimulating, convivial setting with a reception. Poster registration is now closed. The Boonshoft School of Medicine Office of Research Affairs presents a Central Research Forum each fall to showcase biomedical, clinical, medical education and public health research conducted at Wright State University. All WSU investigators, graduate students and medical students are invited to present posters on their work. Sherif M Elbasiouny, Ph.D., P.E., P.Eng. Posters showcase the range of biomedical, clinical, medical education and public health research at WSU. The Boonshoft School of Medicine Office of Research Affairs presented the 2015 Central Research Forum (CRF) on Oct. 22, in the Wright State University Student Union. Highlights are noted below. “Integrating Clinical Trials Into Your Practice"
“How to Monetize Basic Research into Practical Revenue-Generating Applications"
Presenters get two minutes each (using just one overhead transparency) to tell the audience why they should take a closer look at the presenter’s research during the poster session. Posters will showcase the range of biomedical, clinical, medical education and public health research at WSU. See the 2015 Central Research Forum Program (PDF) for details. 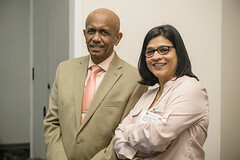 The Office of Research Affairs at the Boonshoft School of Medicine presented the 2014 Central Research Forum (CRF) on Oct. 16 in the Wright State University Student Union. The CRF opened with a keynote session on “The Clinician-Scientist,” with Steven Lindheim, M.D., M.M.M. ; Mark Rich, M.D., Ph.D.; Kelly Miller, M.D.,Ph.D. ; and Arthur Pickoff, M.D. (host). It was followed by a data blitz and poster reception showcasing the range of Wright State's biomedical, clinical and medical education research. Mark M. Rich, M.D., Ph.D.
Kelly L. R. Miller, M.D., Ph.D.
15 presenters will get two minutes each to tell the audience why they should take a closer look at the presenter's research during the poster session. See the 2014 CRF Program (PDF) for details. The Office of Research Affairs at the Boonshoft School of Medicine presented the 2013 Central Research Forum on Oct. 24, in the WSU Student Union. The CRF opened with a keynote session on “Building a Translational Research Collaboration in Orthopaedic Surgery” with Richard Laughlin, M.D. ; Dana Duren, Ph.D.;, and Arthur Pickoff, M.D. (moderator). It was followed by a data blitz and poster reception showcasing the range of Wright State's biomedical, clinical, and medical education research. Reception and Poster Session - See the CRF 2013 Program (DOCX) for details. The Office of Research Affairs at the Boonshoft School of Medicine presented the 2012 Central Research Forum on Nov. 29, in the WSU Student Union. The CRF opened with a keynote session presented by WSU transplant surgeons Brian Stevens, M.D., Ph.D., and Lucille Wrenshall, M.D., Ph.D. That was followed by a data blitz and poster reception showcasing the range of Wright State's biomedical, clinical, and medical education research. R. Brian Stevens, M.D., Ph.D.
Thirteen presenters will get 2 minutes each (using just one overhead transparency) to tell the audience why they should take a closer look at the presenter's research during the poster session. Jared Klein [Poster #9]; Osvaldo Lopez [Poster #2]; Shannon Romer & Adam Deardorff [Poster #53]; Robert Palmer [Poster #60]; Adrian Corbett [Poster #59]; Natasha Hill [Poster #39]; Elizabeth Dulaney-Cripe [Poster #24]; Paul Koles [Poster #3]; Christine Rojas [Poster #47]; Lisa Kellar [Poster #8]; Jeannine Crum [Poster #67]; Ahmed Obeidat [Poster #55]; Manuel Simoes [Poster #13]. The Office of Research Affairs at the Boonshoft School of Medicine presented the 2010 Central Research Forum on Oct. 26, in the WSU Student Union. The CRF opened with a session about practice-based research conducted by SOARnet, the Southwestern Ohio Ambulatory Research Network. The session was held in conjunction with the Medical Student Research Club's Translational Research Lecture Series. It was followed by a session about our newest research centers of excellence, the WSU and Premier Health Neuroscience Institute and the National Center for Medical Readiness. 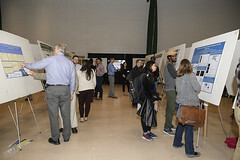 The program concluded with a data blitz and poster reception showcasing the range of Wright State's biomedical, clinical, and medical education research. The Office of Research Affairs at the Boonshoft School of Medicine hosted the 2009 Central Research Forum on March 10, in the WSU Student Union. The program introduced new investigators at WSU Boonshoft School of Medicine and explored recent developments in translational research. 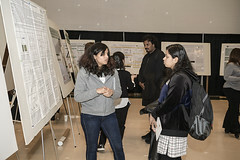 A data blitz and poster session showcased the range of Wright State's biomedical, clinical, and medical education research. Reception and Poster Session - See the list of posters (DOC). In conjunction with Wright State University's 40th Anniversary celebration, the Office of Research Affairs at the Boonshoft School of Medicine hosted the 2007 Central Research Forum on Oct. 23, in the WSU Student Union. The program exploreed future prospects for state and federal funding as well as promising new research initiatives at Wright State. 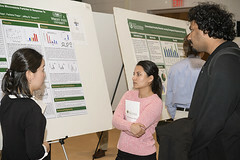 A poster session showcased the range of Wright State's biomedical, clinical, and medical education research. All WSU investigators and graduate students are invited to present posters on their current or recent work. Posters presented at national conferences in the past year are strongly encouraged.